The immediate need, and therefore response, is water, food, and shelter. Relief and rescue. This is what is happening today in Haiti as relief agencies fulfill their God-given purpose. We must keep people alive, of course. We must not let them die of tetanus from wind-flung shrapnel wounds. We must replace their dirty water with clean and reroof their tiny homes with new tin. One aspect of Haitian life that the hurricane decimated was her agriculture sector. Family farms, the basis of livelihood and daily sustenance, were wiped out. Tens of thousands of trees… gone. Small livestock, literally blown away by high winds. Someone has said that 90% of all chickens in southern Haiti were destroyed. Thank God for those in the trenches of relief and rescue. Keep it up! Gardens and trees and farms wont just magically appear tomorrow and fill empty bellies. And while some are literally keeping people alive today, others must MUST think about their tomorrows. For Starfysh’s part, we will plant trees and show the farmers of La Gonave how to reclaim their land and increase their harvests. We are happy to report that we have just signed a long term lease on Life Garden’s second campus. It is a 4 acre fertile plain up in the mountains, a place where we will nurture thousands of tree seedlings for eventual transplanting all across the island. Banana. Mango. Citrus. Papaya, Coffee. Moringa. Almond. Breadfruit. We will restore gardens and reforest an island. Planting trees is a great way to enter the fray. A dollar can go a long way; it can plant a tree that will provide food for decades. 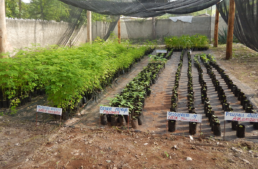 I hope you’ll consider investing in our vision for seeing family gardens and farms thrive on La Gonave. We are making good progress!